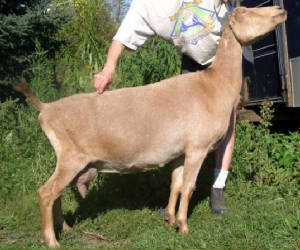 Chippewa is definitely a favorite - she has to be the smartest goat I've ever met - the most mischievous, too. She can unlatch ANY gate (whether bungee corded, binder-twined, wired, you name it! ), then runs around unlatching the others to let her friends out to join in the mischief . 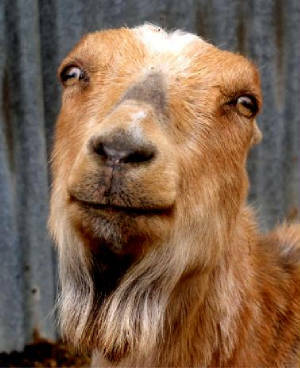 . . & then, once the chaos is discovered & you’re yelling at the mischief-makers, she tucks her tail & runs back into her pen while standing there blinking innocently at you, whilst adjusting her halo! 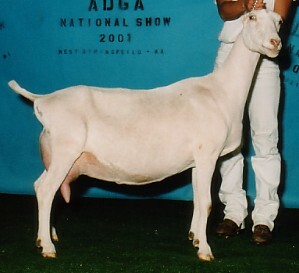 Derived of Hogg’s Hideaway’s famous “Ch-“ line, she is a well-bred doe being the granddaughter of GCH Hogg's Hideaway BXC Ca Zing 2001 ADGA National 1st place 7+, National Grand Champion & National Best LaMancha Udder & the great-grandaughter of GCH Hogg's Hideaway Chimera who was the 1994 & 1996 ADGA National Champion. . . Big hoofprints in which to follow! Chippewa is just an all-around wonderful doe, excelling in General Appearance, Dairy Character & standing on very strong feet & legs. 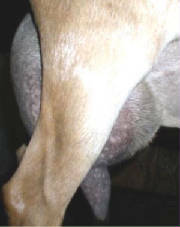 She is a nice, level doe with a correct mammary that is nicely-shaped, well-attached all the way around, nice teat size/shape/placement - & productive! 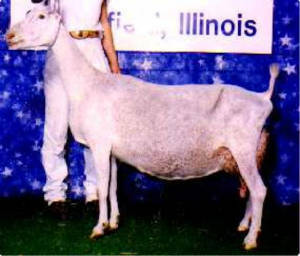 She is very vain & loves to strut her stuff in the ring. We've had so many in the same age class that she doest get out much, but when she does, she routinely stands toward the front of the line in her class, usually behind herdmates & has a couple of RGCHs under her belt, too.